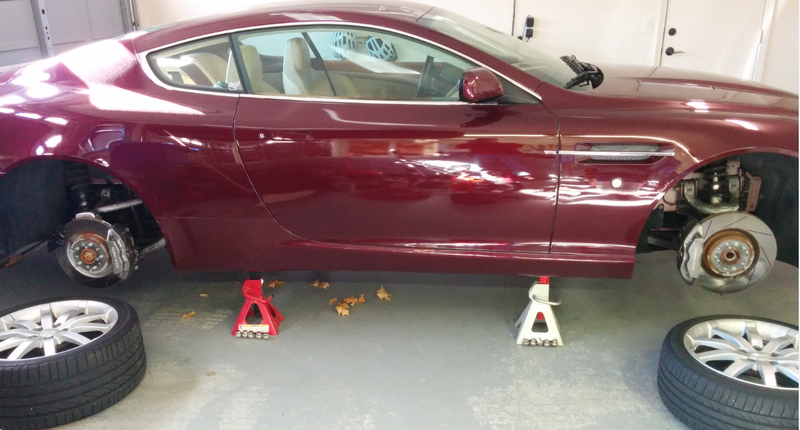 Not every topic is all that exciting, but lowering your DB9 down off Jack Stands safely is important. When you are to this point in a service project you are usually in a hurry just to get the car back on the ground and be done, but spend 1 minute and read on for a couple of quick tips I can share from my experience. Check out my other post on how to raise your car onto jack stands, and it describes the jack, special block of wood, and specific positioning. Be sure to carefully position the jack in the exact same way as when we raised the car. See the other post and video if you aren’t sure what I mean. 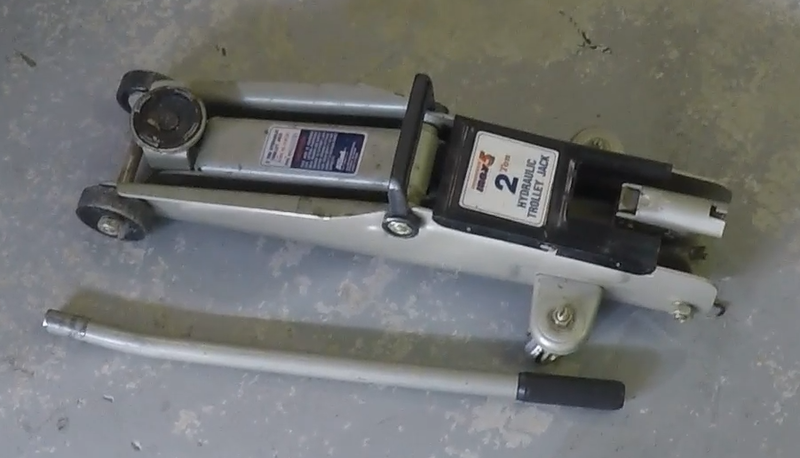 When a trolley floor jack like the one I am using is lowered, the jack scissors and naturally the base needs to roll a few inches as the car is lowered. You’ll notice in the video below I take the time to orient the wheels so they won’t bind as the jack starts to move. If you are lowering the first side off the stands (as in this video) imagine what would happen if you started to lower the car and the jack was stuck where it couldn’t roll. It would then force the car to shift a few inches in the opposite direction, and this could tip (or worse topple) the car off the far side jack stands (bad mojo). Part way through lowering the car you’ll see me stop and then peer under at the far jack stands, this is exactly what I am watching for. Jack the car up slightly to take the weight off the stands. Be sure to double check the exact positioning of the jack and lifting block as you start to take up the weight, and reposition as necessary. 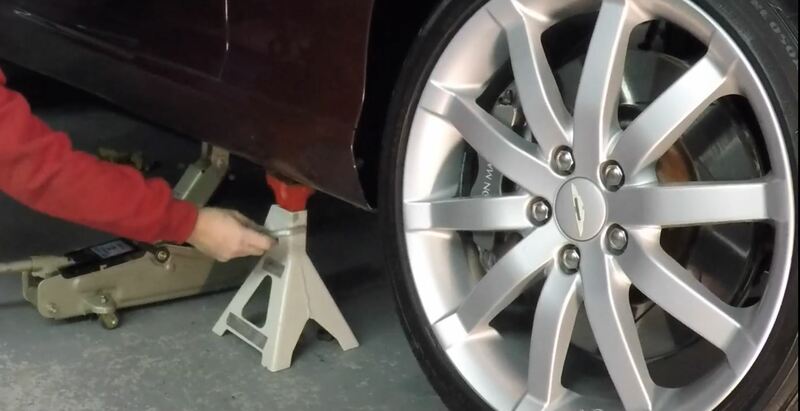 Once the weight is off them, lower and remove the jack stands being careful not to scratch your paint. Lower the car slowly, taking time to monitor the far side jack stands (if appropriate). Lowering too fast (“schwoooop boing”) could cause the body to bounce at the bottom, and your painted lower sill could bang onto the top of the jack body. Now that it’s on the ground, if you’ve had the road wheels off this is the perfect time to torque the wheel nuts (check out my other video on how to do this). Here is a short video of the process in action.